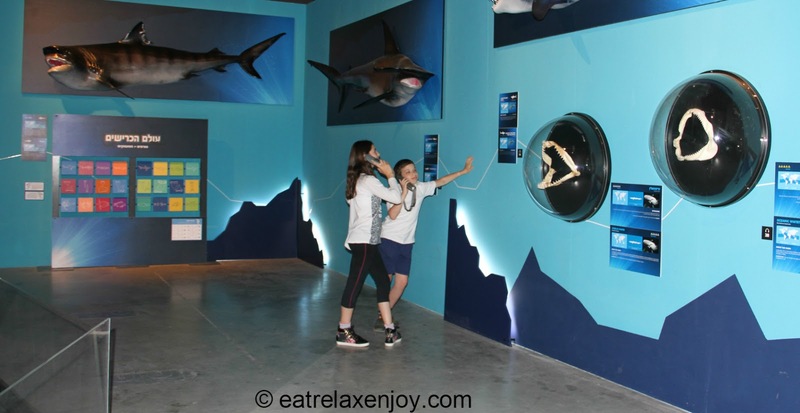 Planet Shark exhibition that will stage at Tel Aviv Convention center during the summer, welcomes an enjoyable and educational visit that provides a look into the world of sharks. The exhibition spans over four 3D multimedia-rich display halls, with the center one displaying a multi-dimensional ambient movie that is screened on countless number of displays that create an interactive immersive experience! 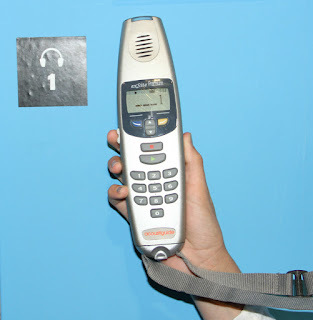 At the entrance to the exhibition you can rent an audio guide. Near each exhibit you’ll see a small number, which is used to identify the track and play the related explanation. The audio guide is not a must, since there are textual explanations (in Hebrew and English) but it adds a lot of information and interest, especially to the science lovers! The audio guide engaged my teens nicely. They listened attentiveness to the explanations. 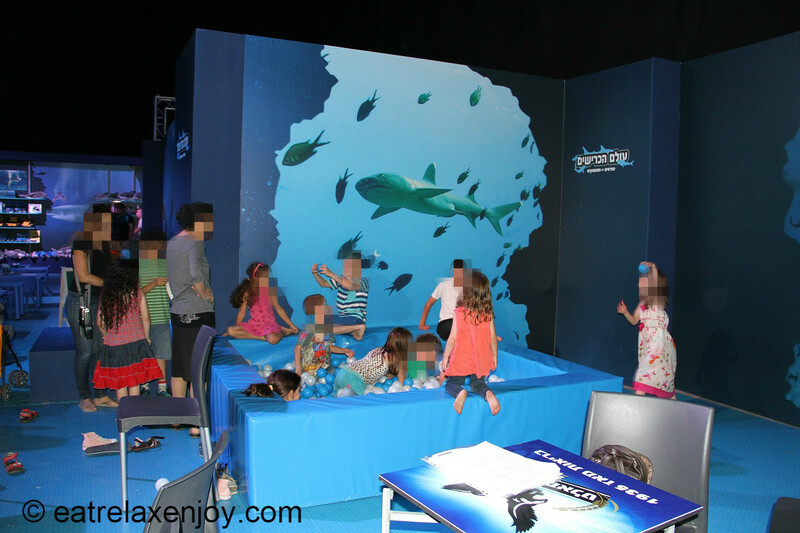 The exhibition provides many opportunities for children activities, such as puzzles. and touch screen displays to learn from. 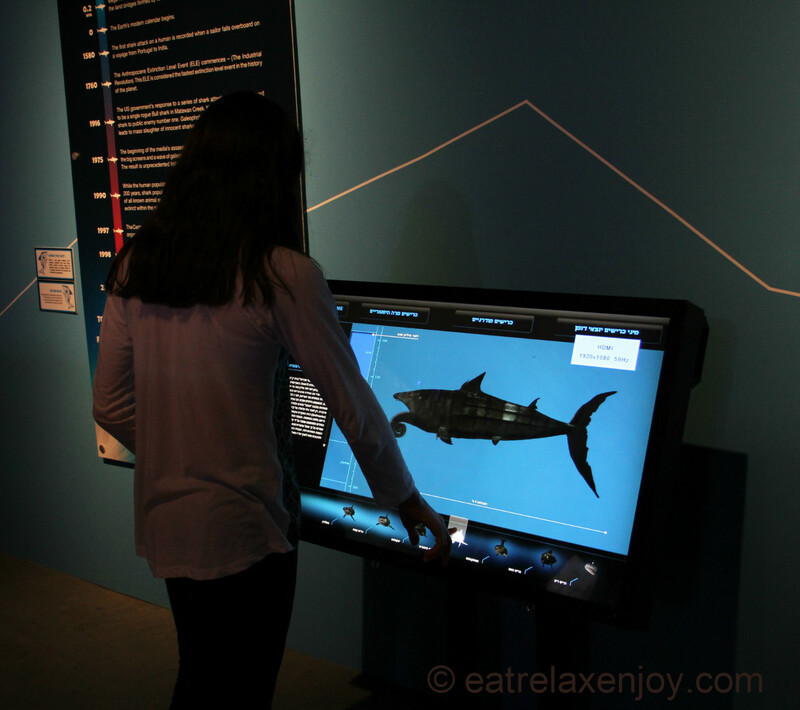 This touch-screen enables browsing the families of sharks. While the exhibition is rich with three dimensional exhibits, it is not scary at all. 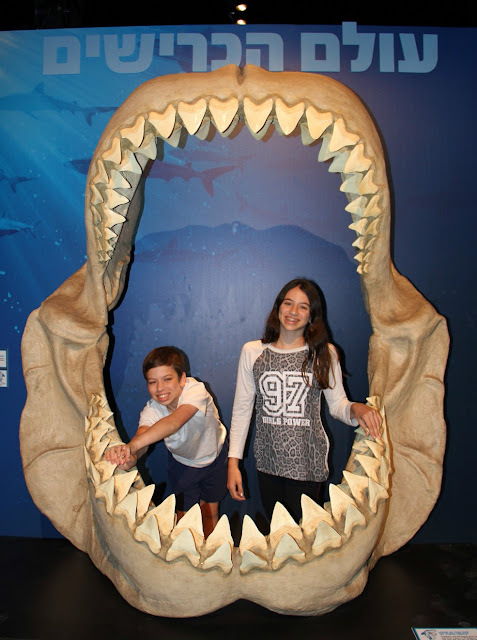 It isn’t a ‘Jaws’ exhibition, it is an educational-ecological exhibition. 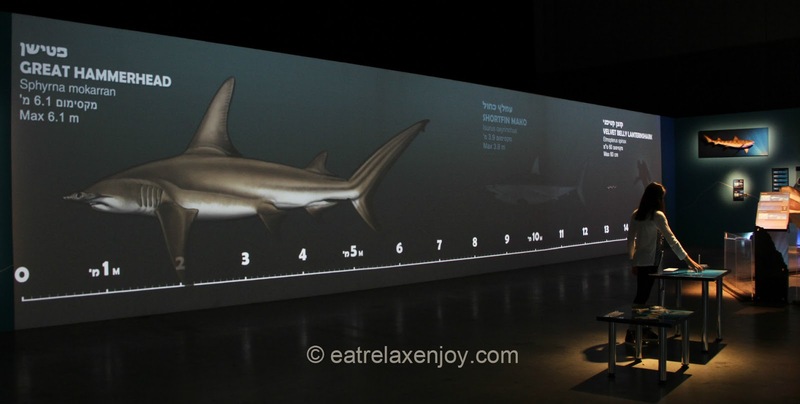 Here is a display that emphasize the size of the different sharks, some of them are huge! when standing next to it, it demonstrates the dimensions of the sharks, especially the big ones! 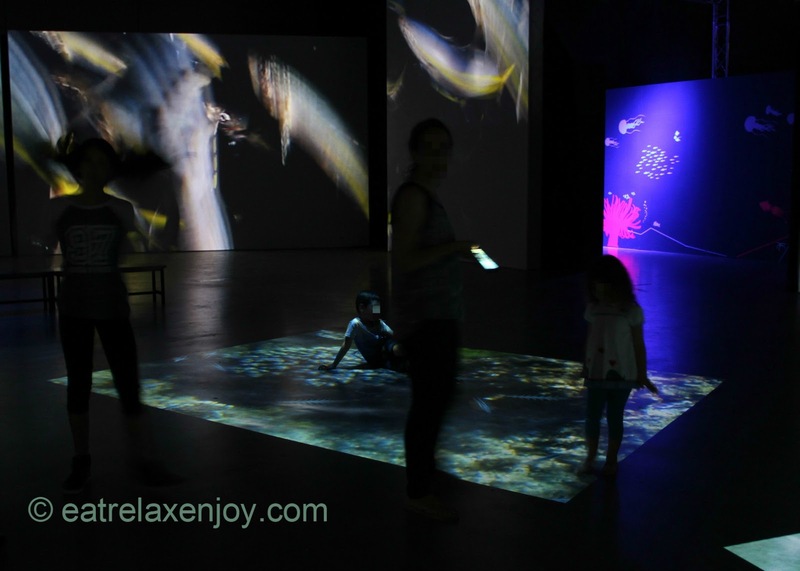 In the heart of the exhibition is the 45 minutes multi-dimensional, 360 degrees movie. This is accompanied by information projected above/nearby timed with the movie and presenting relevant information. The projection is organized in ambient displays so that the audience is fully immersed in the experience. Even the floor is ‘live’! 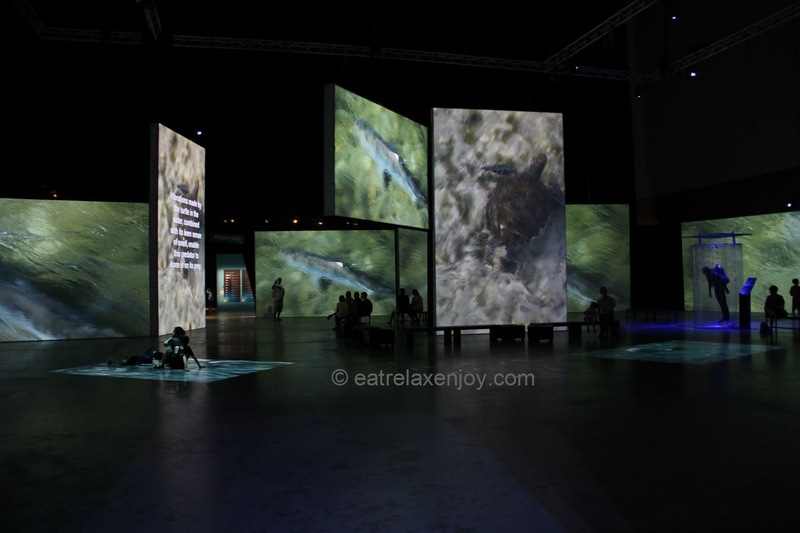 Some projectors are displaying content on the floor – a coral reef with fish swimming. 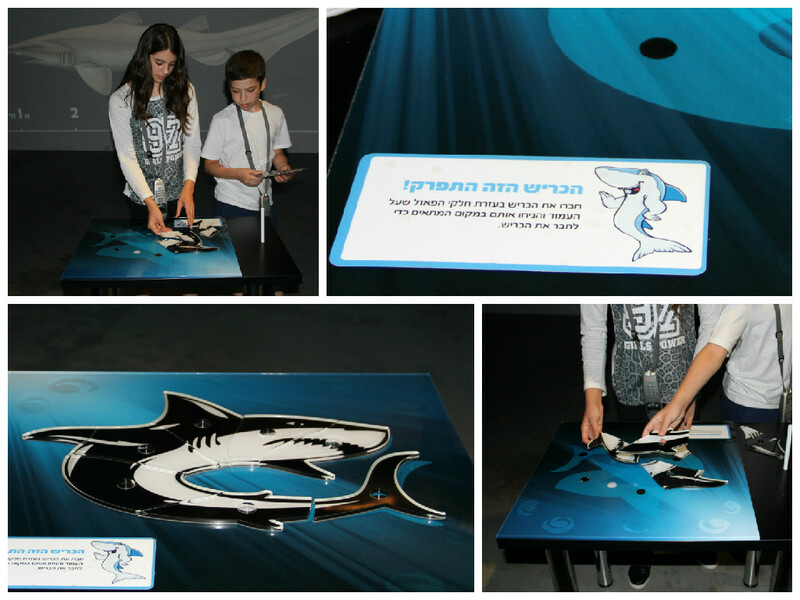 This display is equipped with sensors, and when the children are stepping on it, they create little waves. This is very engaging for the little ones and enjoyable to look for the older ones. At the exhibition you can take a photograph of yourself in the huge mouth of a Megalodon shark, this is also offered in the form of magnets. 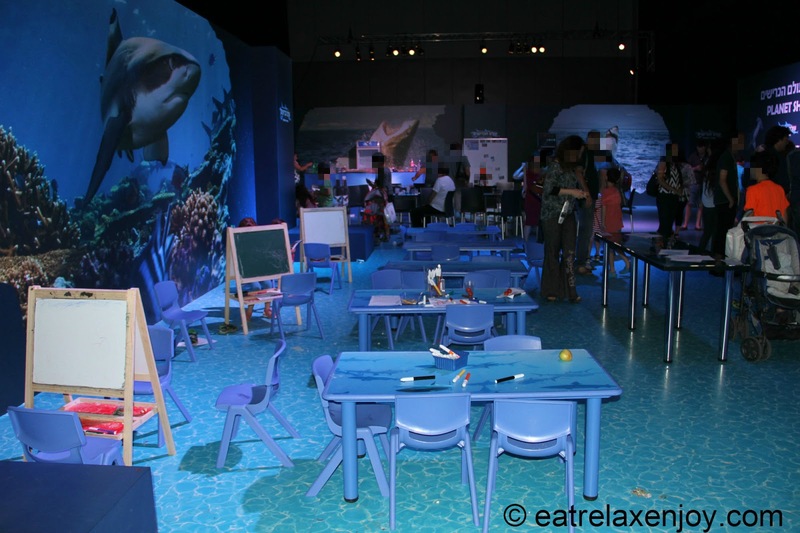 On the way out of the exhibition, there’s a shop and a seating area, including some play area for the little ones – painting tables and a ball ‘pool’. The older ones can engage with an app that tests the knowledge obtained in the exhibition. The organizers waited for 3 years (!) for the exhibition, that was brought here from Australia. The ecological organizations here in Israel are part of the team. 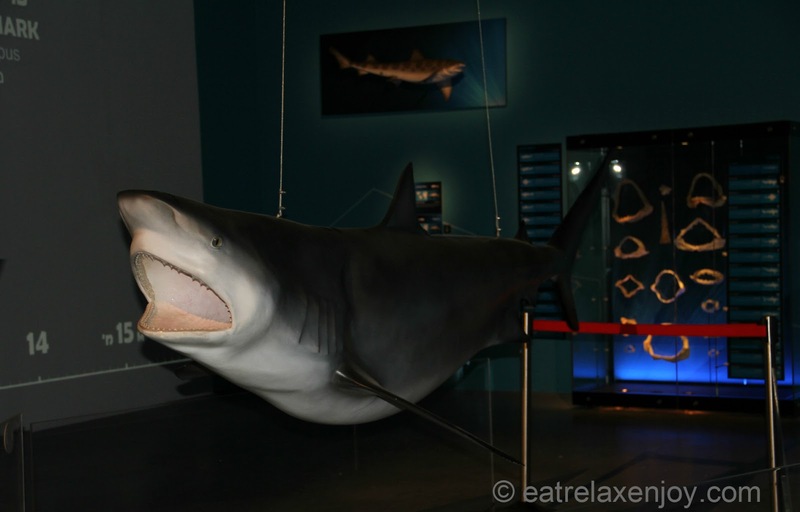 They tell us that there are quite a lot of sharks in the Mediterranean (two species, they are not very risky), which tend to hang out around the power plants (where the water is warm) and the fish cages at deep sea. The exhibition is a wonderful opportunity to spend some quality time, learn and enjoy for all ages, and escape the summer heat. Be aware that the exhibition does not include live sharks! Information: The exhibition is located at the Tel Aviv Convention center and will be open until the end of August 2015. Combined discounted tickets for the exhibition including additional exhibitions (e.g., Lego) will be offered. There is a cafeteria at the entrance hall. The air-condition is strong so bring a jacket if you are sensitive.